I’ve been in the midst of trying to sell my house over the past month. For me, it is total stress. The holidays brought very few showings, but now that the season is over I am hoping that things improve. Sitting around and doing nothing is totally not my style, so as I wait for that perfect person to wander into my house and yell, “This is it!”, I have found myself taking on more and more projects. I’d love to share a few of those projects with you- an upcoming quilt pattern, a few fun camper pot holders, and even a free crochet pattern called a Vintage Ripple Fan Scarf. Want to see? 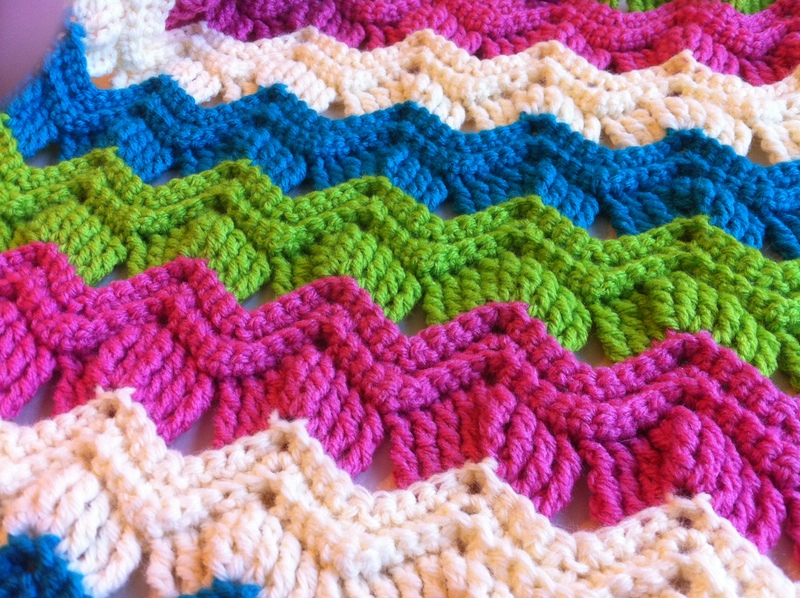 The Vintage Ripple Fan Pattern comes from one of my old crochet magazines. I updated the pattern just a bit and am in the process of making a brightly colored scarf with it. And while I was at it, I even dabbled a bit in the field of videos and created a video to demonstrate the Double Triple Crochet stitches that are used in the fans of this pattern. See, I told you I’ve been industrious! Want the pattern? Page down to the end of this post to find the free downloadable pattern along with my instructional video! But first, let me show you what else is going on around the Sitcom house! I just about have my next quilt pattern ready to be released. It is currently sitting on my sewing table ready to be quilted. I’m going to call it “Party Time”. 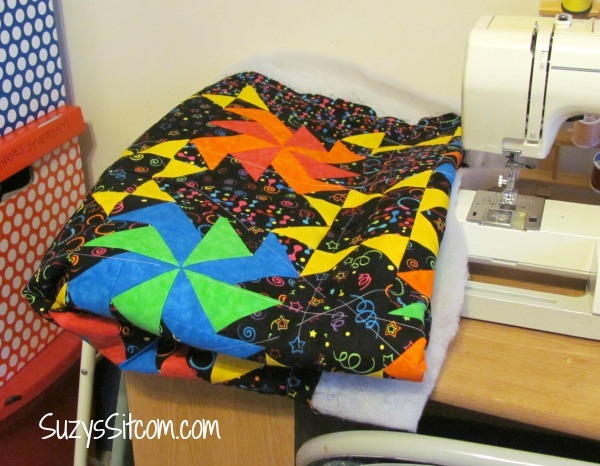 Once the quilting is completed, I’ll need to bind it and then create the downloadable pattern. Expect to see this brightly colored quilt in the next few weeks! As soon as this project is complete, I want to start a “Block of the Month” here on the Sitcom where each month I demonstrate how to create a different 12″ quilt block. For those of you that are beginning quilters, this is a great way to experiment with different quilt patterns and learn the basics. For more advanced quilters, it is a great way to find new patterns you love. Either way, you end up with enough blocks for a nice sized lap quilt when the whole 12 months are put together. Stay tuned for more information on this! 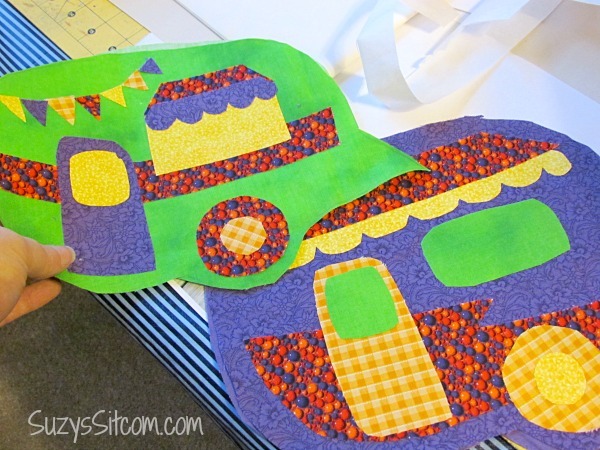 And speaking of bright colors, my mother and I sat down to my fabric collection last weekend and she selected some fun color combinations for some more of my free pattern: Happy Camper Pot Holders. I plan on adding some sets of finished pot holders to my Etsy shop in the next month. So, let’s take a closer look at the Vintage Ripple Fan Scarf Pattern. This pattern is incredibly simple. Much simpler than it looks. 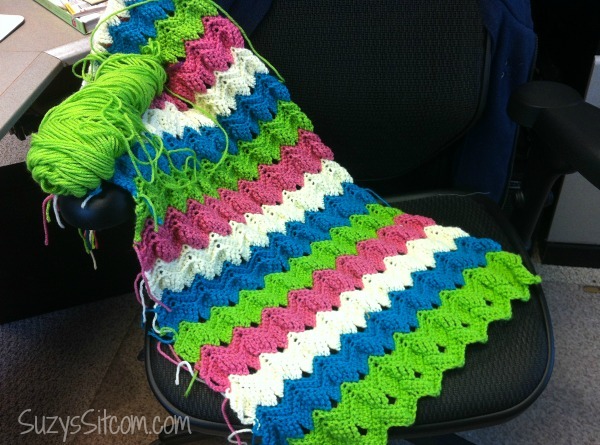 I am having a blast making it because I love the look of multiple bright colors and the combination of the single crochet stitches and Double Triple Crochet stitches makes it come together quite quickly! Not so sure about that Double Triple Crochet Stitch? Well here is a short video to help you out with that. (Please disregard the Mickey Mouse voice and the ridiculous southern accent- it comes with the territory). Important Note: All stitches are made in the back loop only. 2. Start with second chain from hook. Do a sc in each of the next 4 st. (Do 3sc in the next stitch, then another sc in each of the next 8 st.) *repeat until last 4 stitches. Do a sc in each of the last four stitches. Chain 1, turn. 3. (Skip one sc. One sc in each of the next 4 st, 3 sc in the next, one sc in each of the next 4 st. Skip two sc.) *repeat this to the end of the row. Chain 1, turn. 4. Same as row 3. Chain 1, turn. For each color strip from this point on, repeat row 5 and then rows 2-4, changing colors after row 4. Continue with the pattern until the scarf is at the desired length. Want to see the finished project? Click here and I will show you how to finish this scarf and block it. And most likely, I’ll show you a few more projects in process at the same time! Wish me luck on the house sale. Seems I might need it. Ha! Made something with one of my patterns? I would love to see what you came up with! Previous post: 8 Fun Free Sewing Patterns!